I was hoping for another glorious weekend like the last in which I could go outdoors and start removing winter mulch from the garden beds and work on leveling the blocks of the raised bed so it will be ready to fill next weekend. Unfortunately yesterday began with a little much needed rain and remained cloudy and cold all day. Today has been cloudy with a cold north wind. We only made it up to 41F (5C) and are not forecast to make it above 50 (10C) all week even though there are promises of warmer weather Easter/Passover weekend. Spring is two steps forward and one step back. All the snow in my garden is finally gone, even in the shady places. The garlic has grown about an inch taller over the week. 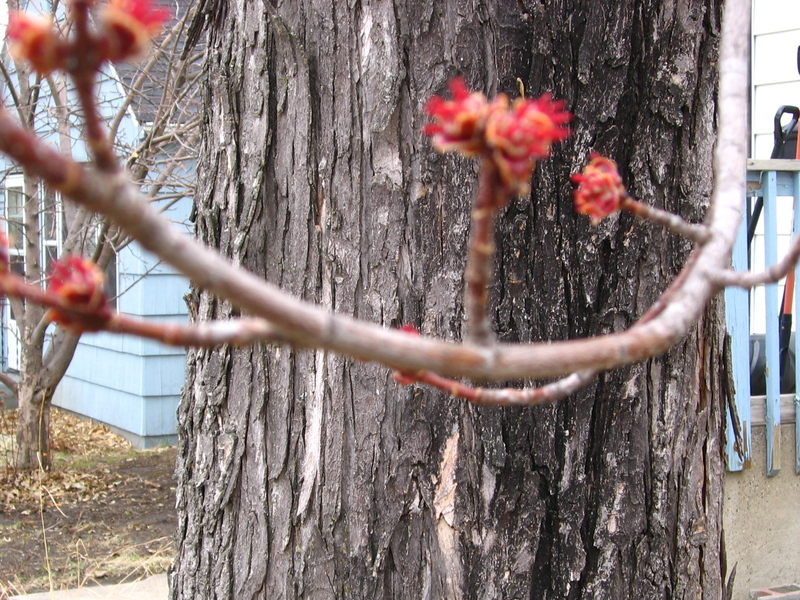 Yesterday I looked out the window at Melody the maple tree and noticed she is flowering. Her buds were closed tight all week every time I looked and then suddenly they are open. It is amazing how fast it seems to happen — nothing nothing nothing and then everything. It is all an illusion of course, there was a lot going on in those tight buds before they burst open. I’ve never really thought much of maple flowers but I never looked closely at them. Today I went out to try and take a photo — my camera did not want to focus on them close up but on the tree trunk further away so they are blurry — and while I was looking at them I noticed how pretty they are. The outside of the flower is a deep red and inside the tiny petals it is orange and the stamens are dark pink. The flowers come before anything else on the tree and they look beautiful against the dark and light grey of the bark. Why I have never paid attention to these flowers before I don’t know. One of my aims this year is to pay closer attention to things like this, to notice and observe. 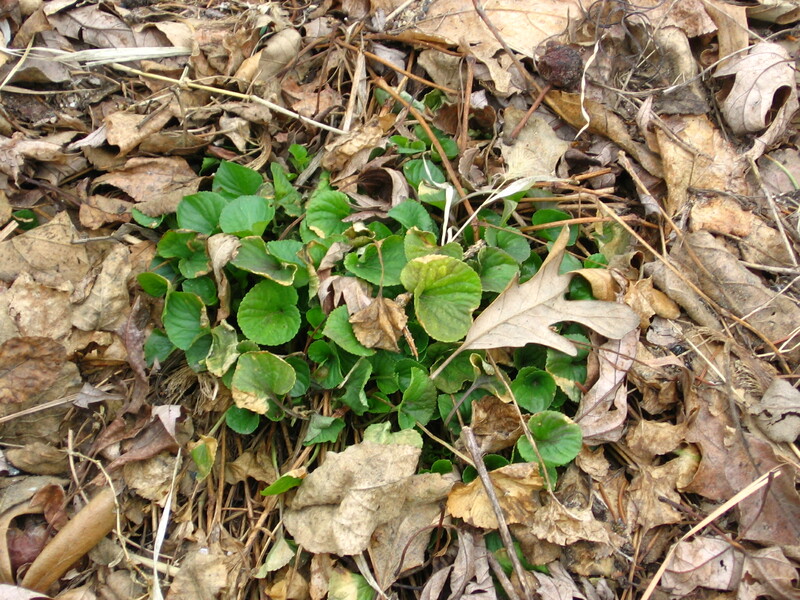 in one of my street-side beds is greening up and creeping out from beneath the fall leaves and prairie violets are are pushing up through their leaf mulch. It makes my heart happy. 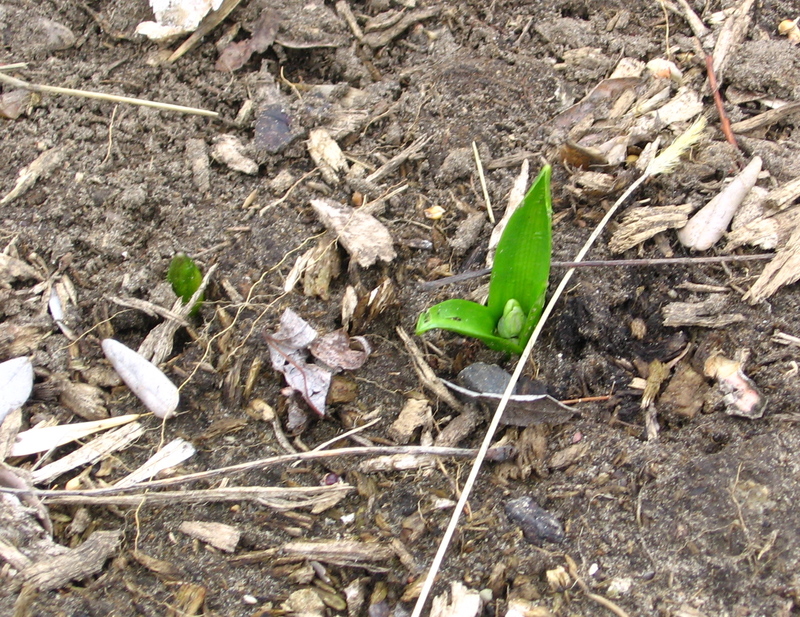 In the back garden I have daily been looking for bulb shoots. Last fall I planted daffodils and scilla along the garden path. My neighbor on the street corner with her long south-facing stucco house wall has tulips and daffodils pushed up several inches already. I see hers and worry about mine, forgetting they don’t have a wall giving them protection and extra warmth. But even when I do remember I get nervous — did the squirrels dig up the bulbs and I didn’t know it? Did the winter kill them all? Did I not plant them right? Where are they? Today a tiny moment of relief, the scilla are sending up leaves. Hopefully the daffodils won’t be too far behind. Bookman and I have spent more time discussing plants to get at the May plant sale. We chose our tomatoes, heirlooms, San Marzano, an Italian paste tomato for canning, and a purple slicing tomato whose name I can’t remember at the moment. We also talked fruit: gooseberries, black currants, Juneberries (also known as saskatoons and serviceberries), lingonberries, raspberries. We had wanted to get a grape but the only ones on offer aren’t really very good table grapes but more for wine or juice so we decided on hardy kiwi instead which is not the same as the fuzzy kiwi fruits though they are related and supposedly have a somewhat similar flavor. And Bookman asserted himself and said he wanted some holly. But holly is not hardy here, we tried it several years ago and the two little shrubs were first beaten down by a summer hailstorm before being finished off by cold and winter snow. However, all was not lost for our Bookman. In my reading about native plants this winter, I came across a native plant called winterberry and when he said he wanted holly I remembered that winterberry is an ilex (ilex being the family name for hollies). Sure enough, the sale has them on offer. The berries are much loved by several species of birds. And so we will get a male and female winterberry and Bookman is so happy that he will have his holly even though it is deciduous and not evergreen. I am very excited about next weekend. I get four days off from work because of Easter. If that weren’t exciting enough, I am signed up for a class at the urban farm store on edible landscaping. It is being taught by a couple of professional edible landscape designers who work here in the Twin Cities so everything they talk about will be relevant and possible for my own garden. I can hardly wait! might say I’m looking forward to next winter in Pennsylvania! This post made me laugh. I recently used ILEX in a Words With Friends game I played with my son and scored about 92! This was just before he was coming up for this weekend. I said “Are you still looking forward to seeing us?”. He said “Only if you use ‘ilex’ in a sentence twice a day!”. I have read out your paragraph to him so that’s me for today! Good luck with the Winterberry. Why are your plants coming up when here it is my weeds? And yes, I know that one woman’s weeds are another’s summer glory but they are my weeds and I don’t like having to pull them out. Alex, the weeds will be coming up soon here too. The ground is still pretty cold but I heard in a few more days it will be warm enough for crabgrass and dandelions to get going. I love dandelions though and don’t consider them weeds. Their greens will be making it into salads, yum! Spring is on its way, promise! I don’t have a problem with squirrels but some creature is having great fun by picking up my grape hyacinth bulbs and putting them where I never intended them to be. I wish I could claim that this is ruining my carefully orchestrated planting scheme but truth be told i don’t have one and I like the unexpected flashes of purple blue in the garden. Just think how much you will enjoy Spring once it really arrives. You have so many gardening adventures awaiting you! Unfortunately we may actually get some freezing temps tonight so my husband is covering our new plants. This is totally weird weather for us. Hope you’ll have fun at your class and you’ll have to share what you learned! Isn’t it exciting to see green in your yard? My front yard bushes (which to be honest I want to get rid of and plant a raised bed with flowers there instead…) is finally beginning to bud. The yard is looking pretty sad, but amazingly (okay not really) there are already a few weeds poking through! cool that you will be able to take a gadening class–something to look forward to. And I am envious of your long weekend! Something else to look forward to! 🙂 Yay for gooseberries–I hope you have an excellent harvest of them. Are they plants that you need to plant every year? Or once the bush is there they just keep coming back (asks the nongardener…)?